I recently found this story on Candy Chang's wonderful blog. I gotta tell you, this sort of thing gives me hope for humanity! "When graphic designer Stefan Sagmeister invited his friend Reini to visit him in New York City in 1988, his friend was concerned about his chances with the ladies. Would New York’s beautiful-but-tough women ignore him? In response, Sagmeister created a poster of his friend’s face under a bold black font declaring, 'Dear Girls! 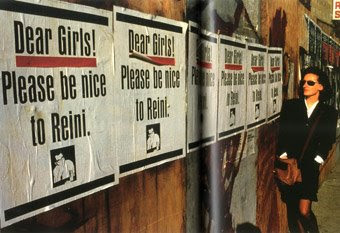 Please Be Nice to Reini' and plastered copies on walls throughout his Lower East Side neighborhood." Did it work? Find out here! WOW! It worked. He left with a girlfriend. Ha! So funny. How did Reini first feel about the idea??? Please be nice to Kiki. It's for your own safety." If my friend did that to me, I'd get so mad. I'd never talk to them again! I can't believe it acually worked though. Lol, XD I agree with raph. IRREGULARS RULE THE WORLD!!!!!! Yay! poor/lucky guy, he has such nice friends. or would it be friend? i dunno. thats cool, if i were a dude with chick probs, i might try that out. but alas, i'm not a guy. I swear if somebody put up signs that said "Dear Boys, Please be nice to Cassie" or something like that, I would totally kill them. XD I'm glad for Reini, 'cause at first I thought he'd be humiliated for the rest of his life! LOL.